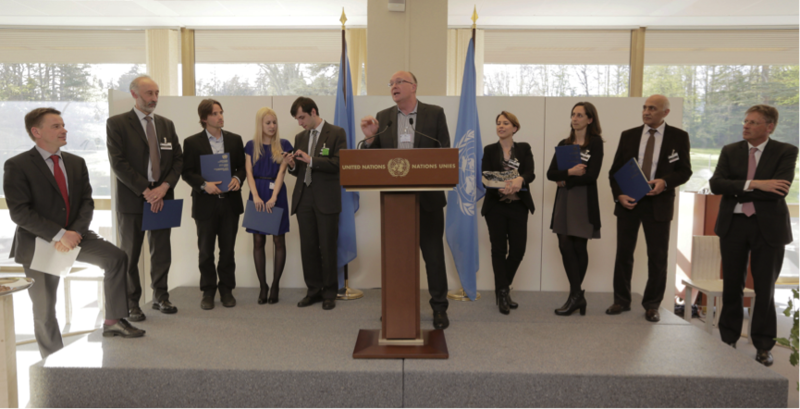 SETsquared has shown its support to start-ups and innovation businesses in Europe at an event held at the United Nations in Geneva yesterday (Tuesday 14 April) by offering a free place to one of the region’s leading start-ups on its acclaimed Entrepreneurship Training programme. Simon Bond, Innovation Director at SETsquared, the university business incubator, which is ranked best in Europe and number two in the world, joined the jury panel at UNECE’s (United Nations Economic Commission for Europe) first event for start-ups at Geneva’s Palais des Nations. The event aimed to showcase how innovative entrepreneurial talent can contribute to address today’s social and environmental challenges, through new ground-breaking ideas that can become successful and sustainable businesses. Following a call for ideas launched by UNECE, six finalists from Spain, Israel, Italy, Armenia and Moldova attended the event to pitch in front of a jury comprised of industry experts and hear from the panellists. One of the leading finalists from the day has been offered a free place to come to the UK and take part in SETsquared’s acclaimed Entrepreneurship Training Programme. The winning start-up, AEInnova, a spin-out from Spain’s Universitat Autonoma de Barcelona, has a compelling microelectronics solution for energy harvesting that turns industrial waste heat into electric power. Simon Bond said: “It’s been an absolute honour to represent SETsquared at the UNECE and to be able to offer a place on our Entrepreneurship Training Programme. SETsquared is proud to support start-ups throughout Europe as well as those rooted in the UK, and the standard I’ve seen at UNECE’s event has been fantastic. Places are available on SETsquared’s Entrepreneurship Training Programme. Visit the Entrepreneurship Training Programme webpages to find out more.